A surface gauge is very useful when finding the centre of a piece of round section material. It is normally used to ‘scribe’ parallel lines. Its base is heavy and this means it is stable when in used. Surface gauges sometimes have magnetic bases and this means they can be locked onto metal surfaces making it easier to use. The diagram above shows the round section steel held in a vee block. The surface gauge is then moved across the surface of the steel, scribing a line. The steel is then rotated through 90 degrees and another line is scribed. This is repeated until a square is produced in the centre (see diagrams below). Diagonal lines are then drawn from each corner of the square to locate the exact centre of the circle. 1. Draw a surface gauge. 2. 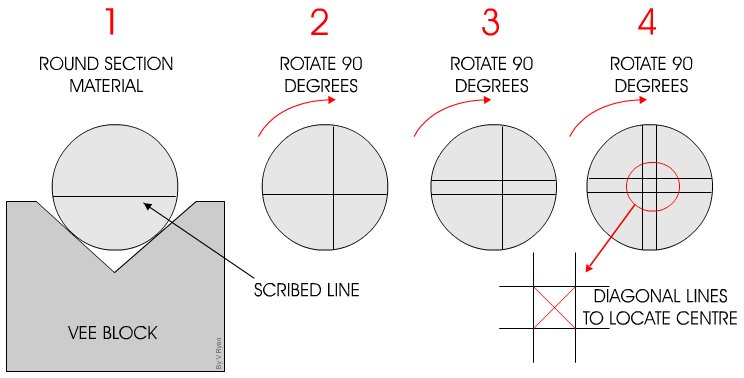 Explain through the use of diagrams how the centre of a round section piece of material is found.